Forget free WIFI and earnestly brewed artisan coffee—a truly great local coffee shop requires a few live owls to perk up the place. At least that seems to be the thinking in Japan. Cat cafes—where patrons pay to play with kitties while sipping their coffee—have been popular in the country for a few years, and it's estimated that there are around 40 establishments in Tokyo alone. 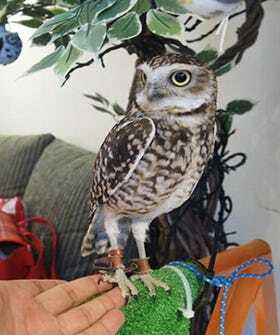 But a new trend has seen the birth of what is locally known as a “fukurou cafe”in Toyko and Osaka, an owl-themed cafe that lets you pet the owls in residence. We're not sure how the owls feel about this arrangement, but we understand that the rules protecting their wellbeing are strict. We also suspect that the wide-eyed glare of a bird of prey might put us off our cappuccino and muffin.